I finished this book pretty quickly and it was brutal. The only other book by Mr. Macarthy that I've read is All The Pretty Horses and his style is spare. I finished that book and felt parched for days afterward, his writing is so minimal and dry as a bone. So a story about a father and son alone in a post-apocalyptic world fit his style to a t. It is a full length novel but such a page turner, and minimal, that I felt like I read a short story when I was done. Hard to recommend this book as it is not easy or fun or happy. But it is fascinating and you never ever know what might happen next. I think next I'm moving onto The Brief Wondrous Life of Oscar Wao by Junot Diaz. It is wondrous to be back into novels again. It's been a while. It's been a while since I've written here as I have not been doing much in the way of reading! Well, I've been reading all the magazines that come to my house. I can't seem to settle down with a good novel quite yet. I find that when I allow myself to ease into that kind of imagination and emotion, I get overwhelmed, what with all the overwhelming things going on in my life right now. So what magazines do I get? I used to get Vanity Fair, but needed a break, so I switched it for the New Yorker. I also used to (ages ago) get fashion magazines, but realized they just annoy the crap out of me. I needed information to feed my head and soul and to teach me something positive and relevant. I don't miss them at all. Sometimes I leaf through them when in a doctor's office or other waiting area and am glad they don't get delivered to me anymore. 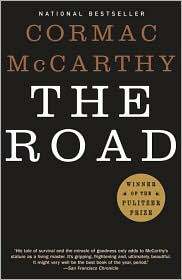 I have put "The Road" by my bed and am almost going to start reading it. Seriously. Soon. I swear.